Happy Monday! Hope everyone had a great weekend! St. Louis had some fabulous weather this weekend! I finally buster open my spring/summer clothes! This top was one of them! I got this top last year at J.Crew and it is back this year at the J.Crew Factory store! Such a great price too! They have 50% off right now! We are back again for another round of bloggers who budget! 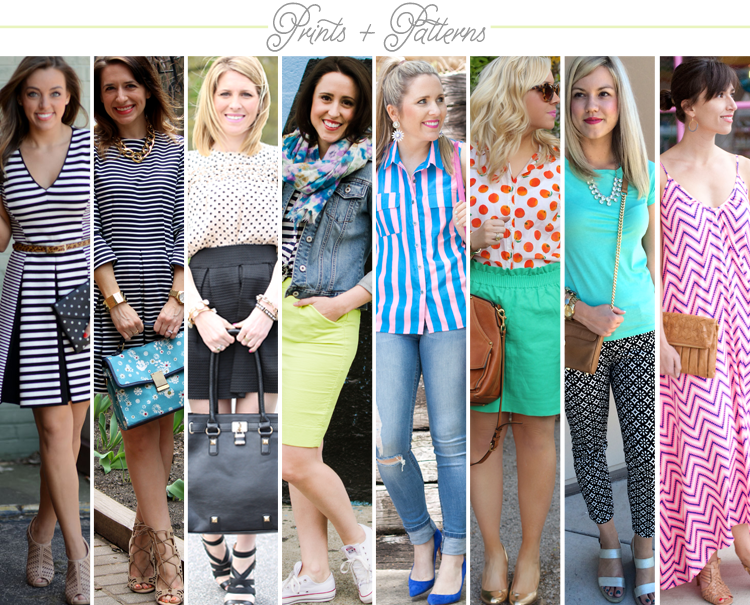 This time, our theme is prints and patterns! Be sure to check out these budget friendly looks! Love the bright colors! Perfect for spring! Loving that printed top! Adorable! That top is so cute on you! I love that style skirt from J.Crew! I have two... oops! I had actually ordered the exact skirt you have on but the stitching was horrible and uneven on the sides.. so weird! I returned it in store but they didn't have any of my size in stock so I had to get something else. So cute on you! Hope you had a good Easter!! Oh my gosh, this top is so cute! Just found and adore your blog! Fabulous looks :) New follower! This print is so much fun and I love it paired with the bright skirt. So colorful and springy! I totally just bought this shirt last week, love it!!! Lovely bright colors. The blouse is absolutely adorable. LOVE every single thing about this outfit. Perfection. I am so in love with this bright color combo! I've been eyeing the Factory version of this top for weeks now. As a dietitian, I feel like I NEED a shirt with fruit on it, right? You look way cute, and I am still loving those awesome gold heels! I keep seeing that top popping up and I love the pattern. It's so cute and fresh and looks great with the skirt! So cute! Love this color combo. That blouse is adorable! Hope you had a wonderful weekend! i snagged that shirt at the factory a few weeks ago and can't wait to bring it out! love this fun and colorful look! Girlfriend, this blouse is too cute. Fab as always.